Healthy Dog Biscuit Recipes Bursting With Natural Goodness! 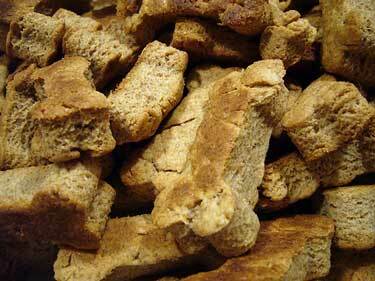 Try Our Healthy Dog Biscuit Recipes! You've landed on this page because you're looking for healthy dog biscuit recipes. Well, you're in luck. You'll find everything you need to bake nutritious home made dog treats to help keep your Cocker Spaniel in tip top condition! Healthy Dog Biscuit Recipes: Homemade is Best! Our great selection of healthy dog biscuit recipes will help you to create mouthwatering (or in this case, muzzle-watering) home-made dog treats that are not only delicious, but full of natural goodness. Unlike many shop-bought biscuits and treats, these recipes contain no artificial colors or preservatives, good news for all! Preheat the oven to 325 F/160 C/Gas Mark 3. In a large bowl or in the food processor, combine the flour, oatmeal, cornmeal, brewer's yeast, and powdered milk. Crumble the stock cube and add to the dry ingredients. Stir in the eggs, oil, and water and mix thoroughly to form a stiff dough. Turn the dough out onto a lightly floured pastry board and roll to 1/4 - 1/2 inch thickness. Cut into the desired shapes (bone-shaped, stars, squares) with a small knife, or use a 'dog bone' cookie cutter. Place the biscuits on a non-stick or lightly greased baking sheet and bake for 40 to 50 minutes until golden brown. Cool the dog biscuits on a cooling rack or leave in the oven to cool and harden overnight. Healthy dog biscuit recipes are so easy to make and so much better for your dog's health than most shop-bought! Our 'Liver and Oatmeal Crunch' is a particular favorite of Max's, and many of his doggie buddies. You can substitute raw liver for liver powder (1/4 cup) which can be bought at most natural food or health shops, but personally, I think there's nothing better than the real stuff! Why not try baking a batch for your Cocker Spaniel and watch that tail wag with appreciation? Add the yeast to a large bowl and then add warm water. The yeast will begin to dissolve, causing the mixture to foam. Add the chicken stock, honey, parsley, and the egg to the yeast and mix well. Add wheat flour to the mixture, gradually, to make a stiff dough. Turn out onto a lightly floured board and knead until it forms a smooth, pliable ball. Roll out the dough until it is 1/4 inch in thickness. Cut into shapes using either a cookie cutter or a sharp knife and carefully place the biscuits onto a non-stick baking sheet. Bake in a preheated oven for 30 minutes before turning the biscuits over and cooking them for a further 15 minutes. Turn off the oven and leave the biscuits to cool over night. I'm sure you'll enjoy baking these healthy dog biscuit recipes. Your Cocker Spaniel will certainly enjoy tasting them! Preheat oven to 325 F/165 C/Gas Mark 3. In a large bowl combine the yeast and warm water; the yeast will dissolve and the mixture will begin to foam. Add the egg, chicken stock, and honey to the mixture and blend. Add the flower and cracked wheat and mix well until you have a firm dough. Turn out onto a lightly floured board and knead until it's pliable. Roll out the dough until it is 1/4 inch thick. Cut out your desired shapes using either a biscuit cutter or a knife and place the biscuit bones onto a non-stick baking sheet. Bake the dough shapes in the over for approximately 45 minutes. Turn off the heat and leave the biscuits to cool in the oven overnight to harden. Home made dog biscuits are so simple to make and yet so tasty - they make great training treats for your dog! Although it's advisable to avoid too much garlic in your Cocker Spaniel's diet, small amounts of garlic can be good for him and also help to deter fleas from taking up residence in his coat. Preheat the oven to 400 F/200 C/Gas Mark 6. In a large mixing bowl, combine the dry ingredients - the whole wheat flour, wheat germ, yeast and salt. Blend the oil and garlic together and add to the dry mixture. Add the stock and mix ingredients thoroughly until you have a slightly sticky dough. Knead the dough and roll into a ball. You may need to add a little flour to the mixture if it's too sticky. Turn out onto a lightly floured board and roll out until the dough is approximately 1/4 inch thick. Cut into desired shapes with a knife or a biscuit cutter and place on a non-stick baking tray. Turn off the oven and allow the biscuits to cool and harden overnight. The number of treats the above healthy dog biscuit recipes produce may vary depending on how thinly you roll out your dough and the size of cutter or shape used. The only way you can be certain that your dog's treats don't contain unwanted ingredients, such as artificial colors and preservatives, is to make them yourself using our nutritious healthy dog biscuit recipes. All of the ingredients used in these healthy dog biscuits are full of natural goodness so, go on, treat your dog now! If you'd like to leave a comment about any of our recipes, or if you'd like to share a couple of your own healthy dog biscuit recipes with us, we'd love to hear from you! More Recipes For You And Your Dog To Try! Here's a tempting selection of quick and easy dog biscuit recipes such as Chicken and Parsley Bites, Savory Oatmeal, and Chicken and Sunflower Biscuits. Our delicious gourmet dog biscuit recipes will have your Cocker Spaniel eating out of your hand! Our homemade dog biscuit recipes are fun and easy to make. Why not try them for yourself and see? Your Cocker will love these delicious biscuit recipes made with peanut butter. Doesn't he deserve an occasional treat for being a good boy?